Grateful Imperfections: Sitar? Keytar? Oh….guitar!!! Mason’s new daily interest is the guitar, although when he says it, it comes out some days as sitar and other days as keytar. lol! We couldn't be more thrilled about his new interest! 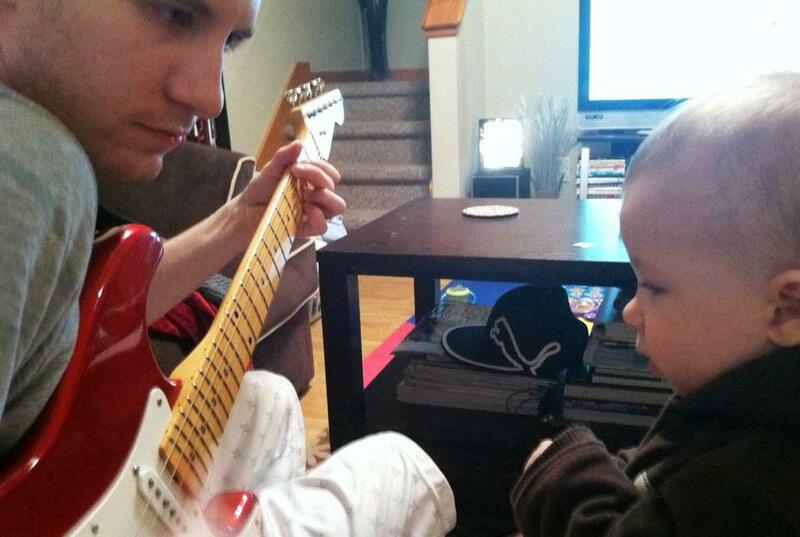 My hubby plays guitar and having a guitar in the kitchen, living room, or basement is not an unusual scene for us. So, Mason has quite a bit of exposure to the guitar. Mason got an early “lesson” in guitar playing when he was younger, but now that he’s a little older he can pick the strings a little easier and it seems that he’s definitely more interested. He has shirts and pjs with guitars on them and he will pretend he’s playing guitar on his belly, he has several play guitars that he’s constantly rocking out with, and of course he now has access to daddy’s guitars which is even better. Right now it’s all in fun, but I don’t think it’s ever too early to introduce music or musical instruments to our little ones. Music is a natural part of life for toddlers. They might sing to their stuffed animals, tap their feet to the rhythm of nursery rhymes, and enjoy the sound of their parents singing to them. 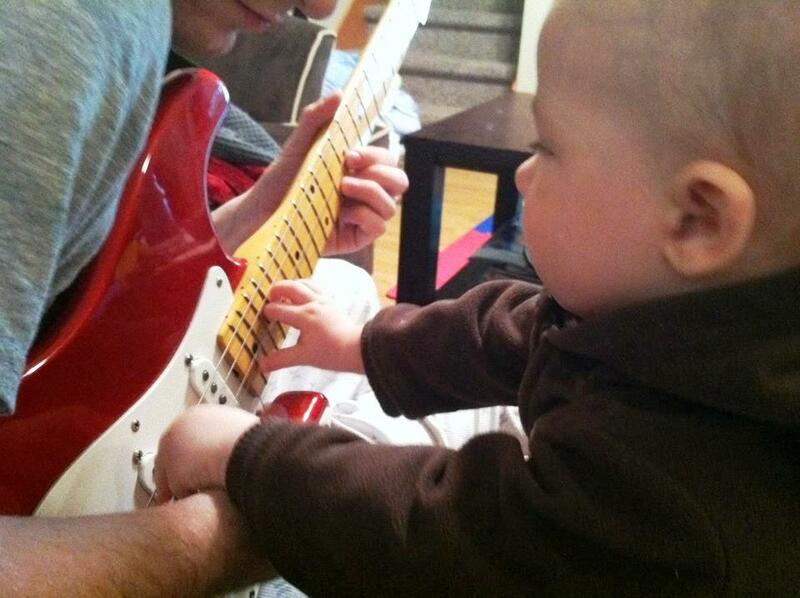 But this early introduction to music does more than entertain. It can kickstart learning, serve as an important cue in a child's routine, and offer lifelong benefits. Music contributes to what experts call "a rich sensory environment." This simply means exposing kids to a wide variety of tastes, smells, textures, colors, and sounds — experiences that can forge more pathways between the cells in their brains. These neural connections will help kids in almost every area of school, including reading and math. Just listening to music can make these connections, but the biggest impact on comes if kids actively participate in musical activities. For more facts and information on how music is “instrumental” for your toddler you can visit Kid’s Health. For Jordan and me, music is an important part of our life; it always has been. We hope to instill that same importance and love for music in our munchkin. It will never be something we force, but seeing how Mason is developing lately we can already see his love and interest in music and we couldn't be more excited. We will have more information about how important music is to us and how you can be involved on our Music page soon.